Two young ladies decided to dig it out in public following a heated argument between them. According to information gathered online, the two ladies fought each other after allegedly clashing over a man. In a trending video posted online, the ladies can be seen throwing themselves punches before landing on the ground and exposing their bodies as they seemed unbothered and didn’t even care to stop. 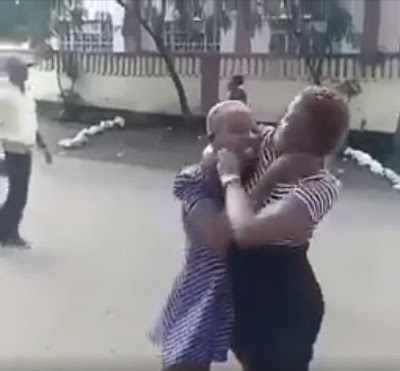 While this was going on, people who gathered at the scene to be entertained by the fight – couldn’t stop the ladies as they engaged in the public brawl while some even filmed the incident which has now gone viral.